New Labour is famed for its spin-doctors and deceit. Their 13 years in government will be remembered for misleading the public over the case to go to war, for covering up the BAE scandal and most recently for trying to convince us that police officers spend 80% of their time on the beat. Recently however, our sitting MP looking for re-election, David Drew, has also been peddling his own kind of deceit. A full-page advert has appeared in the Stroud new and Journal along with its sister paper the Gazette (see photo). The advert, which at no-point mentions the word “Labour”, starts by saying, “Dear Green (and other) voters in Stroud…if you want a “Green MP” who campaigns against…”. It is, in my eyes, a cynical attempt to miss-lead and/or confuse the voters. Local Green Party members have been furious thinking it was the Green Party is telling them to vote Labour! Green tinged voters have been baffled when they have seen Green activists on the streets (“I thought you were telling us to vote for David?”). There are a few points that should be drawn out about this advert. One, this is part of wider campaign by David Drew to distant himself from his party. He is enough of a politician to spot that after 13 years of deceitful politics the word “Labour” is toxic in the voters mind. He is pushing for his loyal supporters to come out and vote for him despite his party affiliation (if there is one thing that defines Drew’s 13 year stint it is his constituent case work). On this front however, this advert has to be considered an own goal. David presents himself as an ordinary chap, who does not sink into these sorts of “nasty” politics. I think a number of voters will be severely put off by this latest move. Two, David Drew is not a “Green MP”, in the sense that he neither truly represents an environmental agenda nor a full political agenda that the Green Party does. Lets be clear, a man who supports Nuclear Power (and holds no answer to waste) and who voted against including shipping and aviation into the climate change bill cannot be an environmentalist. Equally, he cannot be considered a “Green” (in the Green Party sense of the word) as he supported the war in Afghanistan, supports ID cards, has opposed equality by voting against progressive legislation on LGBT rights and obviously, is a big supporter of Nuclear power. 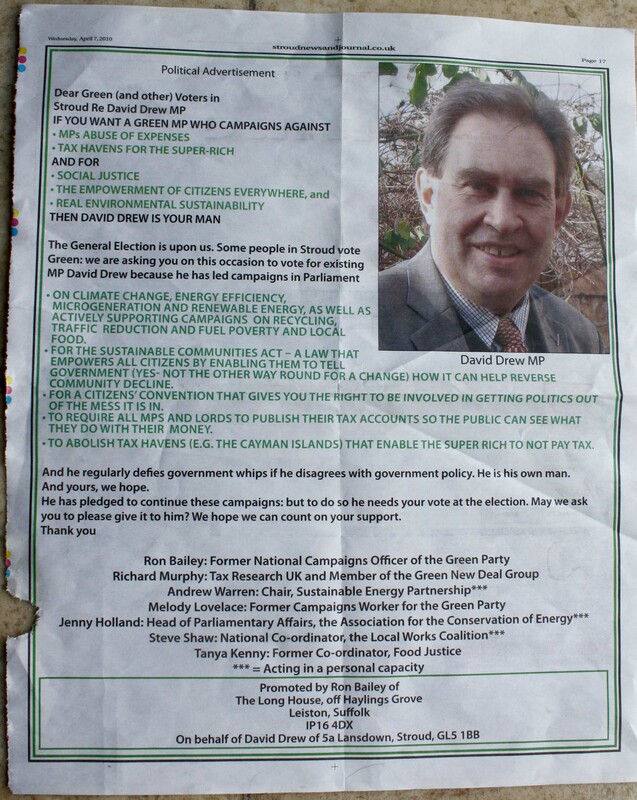 This is not a “GREEN MP” by anyone but Ron Baileys standards! The Green Party continues to make a case for change. As good as any MP is (and lets be honest Drew is one of the better ones) they cannot bring about change when they work in a rotten system. David is still obliged to follow his party whips (the Greens do not have party whips), David is still tied to a party who refuses to bring about real electoral reform (a promise from their 97 manifesto). Only the Greens can truly bring about the change this country needs. This is why it is so exciting that the Greens look like they will be getting their first MP’s this May. It is time for people to start voting for what they believe in, I want Green, not Grey!